The Land Cover Map of Catalonia (MCSC) is a high resolution thematic cartography of the main types of land cover of the country (forests, crops, urban areas, etc.). 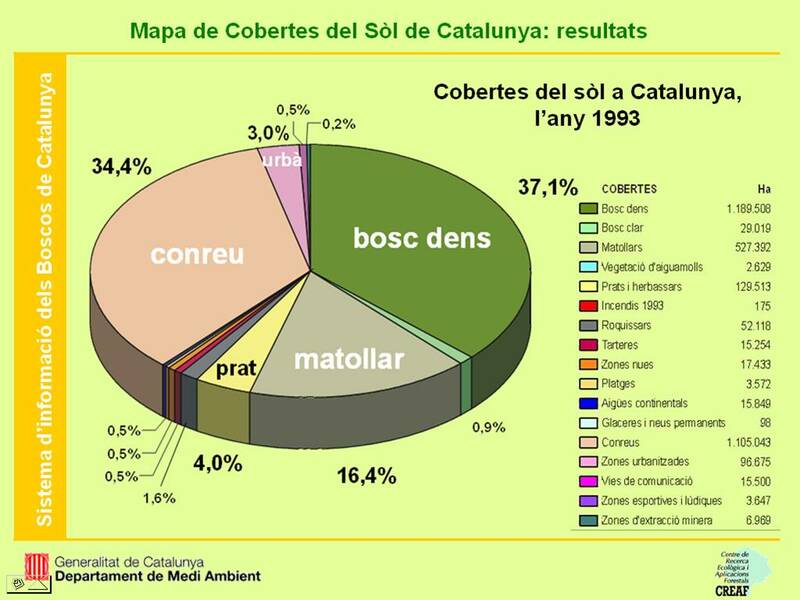 The MCSC is carried out in the Centre de Recerca Ecològica i Aplicacions Forestals (CREAF), with the funding of the Generalitat de Catalunya. El MCSC is part of the Internet available Cartography of the Generalitat de Catalunya and is, therefore, free to use. The MCSC is presented in digital format. The different areas are delimited by photointerpretation and digitalization on computer screen, using the MiraMon GIS. In recent decades, changes in land covers and soil uses have sped up. These changes produces impacts on the environment and the landscape. Every territorial management or planning that tries to avoid or resolve these problems, necessarily requires the cartography, the snapshot, but also the evolution of land uses and land covers, and changes in landscape structure. The MCSC is a basic cartography of the land covers that, which currently has four editions. Thanks to the different editions of the MCSC, will be possible to know, among other things, if the forestry area increases or decreases, or if the urban pressure affects non-suitable territories for this use. The MCSC, due to its high level of detail, is of great interest for the territory knowledge, but also for the evaluation of the soil occupation in every site, in both points of view, ecological and economical. With the MCSC we can obtain the area of forest or crop at level of county, municipal, natural park, etc, and exctract the corresponding maps, plan the design of field samplings (such as the Ecological and Forest Inventory of Catalonia), connectors between natural areas, studies for urban and territorial plannings, infrastructure (the electricity grid distribution, the layout of means of communication, etc. ), irrigation plans, evaluations ofenviromental impact , etc. L’estudi dels canvis de cobertes del sòl al llarg del temps permet posar de manifest les transformacions dels paisatges i conèixer quines han estat les forces modeladores de l’entorn i quins altres impactes es poden derivar d’aquests canvis. També pot ajudar a preveure els canvis que esdevinguin en el futur, i en conseqüència ajudar a avaluar aquestes transformacions abans que realment s’hagin produït i això sens dubte és especialment important en l’actual context de canvi climàtic. En definitiva, es tracta d’una eina bàsica per a l’estudi, la planificació i gestió del territori.